Myanmar's election oversight body has decided to proceed with the general election, as scheduled, next month, according to a government announcement Tuesday evening. "After reviewing statements from committee members about the pros and cons of postponement of election date, the Union Election Commission has decided to hold the general election on the previously scheduled date, November 8, without making any changes," said an announcer on the military-run Myawaddy television channel. The UEC notice was also posted on the Ministry of Information's Facebook page. Earlier in the day the UEC had pressed the nation’s major political parties to agree to postpone national polls scheduled for Nov. 8, citing recent natural disasters. 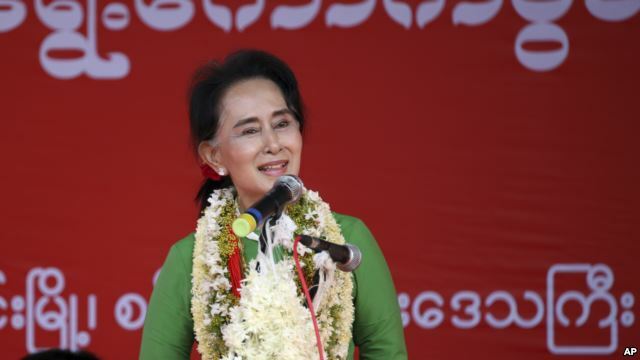 The National League of Democracy of Aung San Suu Kyi was the only party present which objected during an emergency meeting of the Union Election Commission held in the capital Naypyidaw, according to party officials. "I responded to the UEC that the 2008 constitutional referendum was even held a few days after Cyclone Nargis which killed more than 100,000 people,” NLD central executive committee member Win Htein told VOA. “The present natural disasters are not as severe compared to Nargis. That’s why, we absolutely opposed the postponement of the election date." The election commission cited recent flooding disasters, which killed more than 100 people, in Harkar in Chin State and Kawlin in Sagaing Region as reasons forcing a delay. Approximately 1.6 million people have been “critically affected” by flooding in Myanmar in recent months, according to government agencies and the U.N.’s Office for the Coordination of Humanitarian Affairs. The Union Solidarity Party, the Farmers’ Development Party and the National Development Party are backing the election commission’s proposal to delay the polling. Observers said three other parties said they would leave the matter up to the election commission. Several other ethnic-based parties invited to the emergency meeting did not attend. The election commission earlier announced that balloting on November 8 would not be held in hundreds of villages — mainly in Kachin and Shan ethnic areas where armed groups continue to resist state control. There is speculation that an underlying motivation for a postponement was political. The opposition, pro-democracy NLD — the longtime nemesis of the country dominant power, the military — is predicted by many political analysts to make major gains in the upcoming election. A public announcement by election commission is expected within the next several days with some politicians anticipating it will push ahead with delaying the polling nationwide, despite the NLD’s objection. The NLD secured 80 percent of the legislative seats in the 1990 election but the results were nullified by the military which refused to hand over power and put Aung San Suu Kyi under house arrest for years. The polling would be the first general election since a nominally civilian government was installed in 2011. But, with the military still firmly in control of the process, there has been widespread speculation about whether the election can be free and fair. Under Myanmar’s laws the next election needs to be held between 30 and 90 days prior to the next parliamentary session convening, which is set for January 30. More than 6,000 people have filed to run for positions in the national parliament and regional legislatures. However, at least 75 independent or opposition party candidates were disqualified, many because of the citizenship status of their parents. The governor of Japan's southern island of Okinawa has followed through with a promise to revoke permits for construction of a new U.S. air base on the island, setting up a possible legal showdown with the central government in Tokyo. Takeshi Onaga announced the move Tuesday, a month after he said his government would take the action after discovering "defects" in the original permits issued by his predecessor. 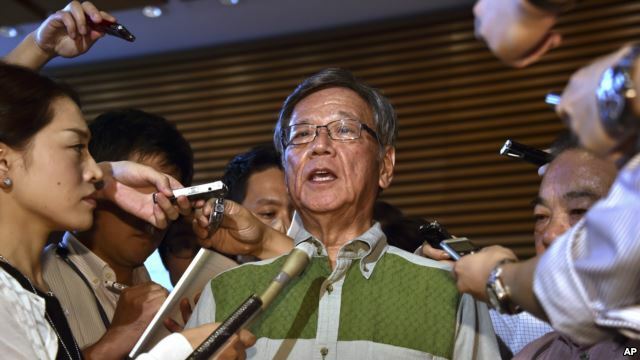 Onaga was elected late last year on a campaign pledge to block the relocation of the U.S. Marine Corps' Futenma Air Base from a heavily populated area of Okinawa to a less-developed area named Henoko. Japanese Chief Cabinet Secretary Yoshihide Suga called the governor's decision "regrettable," and vowed that construction on the air base would continue, despite Onaga's actions. Construction had been suspended for a month in August to allow for negotiations between Onaga's administration and officials in Tokyo, but talks broke down. Tokyo and the United States negotiated the relocation in recognition of residents' complaints of noise pollution from the air base, as well as its location in the middle of a residential area. More than 19,000 U.S. Marines are stationed in Okinawa in order to rapidly respond to regional threats, provide disaster assistance and defend the interests of the United States and Japan.